Jeans are amongst the most versatile and durable items of clothing in a person’s wardrobe. But despite their toughness, they aren’t exempt from getting dirty. Jeans, just like everything else in your closet, need to be washed. While cleaning your jeans may seem quite simple, there are a few important tips that will get them cleaner, prevent fading, and make them look as good as new. Jeans have many diverse functions and some pairs are worn with the intention of getting dirty while others you would prefer to stay a bit cleaner. By separating work jeans from nicer jeans, you can help to keep your casual or dressy jeans as clean as possible and not have to worry about the dirtiness of your work jeans. The best place to start when you are going to clean a pair of jeans is to look at the tags on the inside. Here you will find how the manufacturer suggests you should wash their product. However, the care instructions aren’t very comprehensive and there are other important things to know other than just what is printed on the tags. By turning jeans inside out, you reduce fading and allow for more effective wrinkle removal. 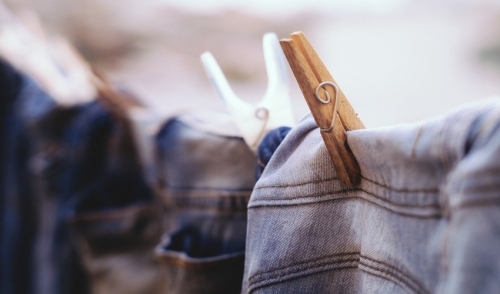 This easy step can add years to the life of your jeans and keep them looking brand new. Jeans contain a good amount of dye, which is susceptible to running off. By washing jeans with other jeans, you can prevent your other clothes from turning blue. This is especially important for new jeans as their dye runs off more easily. Washing jeans in cold water is much more effective than washing in hot water. In hot water, your jeans may fade and shrink. When you put jeans in the dryer, be sure that it is set to the lowest heat setting. High heat can cause extreme shrinkage and fading and actually damage the denim itself. If you attempt to shrink jeans in the dryer, they will shrink unevenly. Instead, take them to a tailor or tailor them yourself.